My new companion's name is Elder Perfili, (an Italian name, it's a little hard to say, all you have to remember is Per-Philly-cheese steak.) He's from San Diego. I don't have much to tell you from last week, it was only a few days ago. 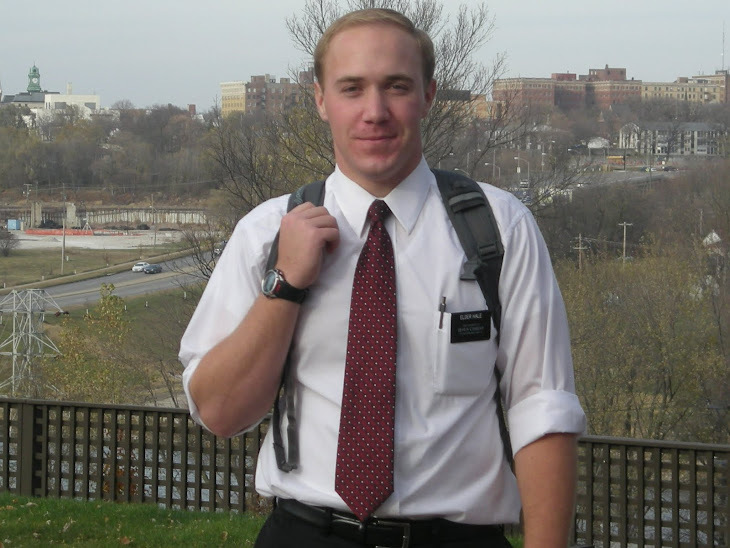 But Elder Perfili is a new zone leader. 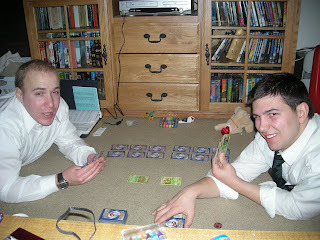 We have both been out the same amount of time and even trained missionaries at the same time. He's full of energy, I talkin' full of energy. Every morning he wakes up and yells "HORAH FOR ISRAEL! ", then I kind of mumble something like, " horrah, I'm awake...." We are a little different but it will all work out. We created a new zone emphasis for the next two transfers. It's called, BAND OF BROTHERS. Its going to be so good. A Plan of Salvation kit. You know the one with a construction paper cut out of pre-mortal life, the veil, birth, earth, death, spirit world, and so on. . . something that you would use in a family home evening, or ask the missionaries in the ward to help you out. Something basic and laminated so I can carry it around with me. Sorry you got me thinking of what I could use. So mom is back in the Relief Society presidency, that great. In our ward we just got a new Relief Society president. We had dinner at her house last week and she said that its been a little stressful getting up to speed with the ward and where everything is at, but once you're there it's easy. Tomorrow we have zone leader council. We have it every first Tuesday of the month, but instead of the meeting being held in Des Moines, it's in Iowa City. 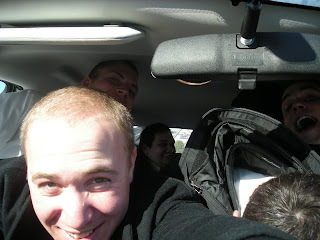 I never thought that I would be driving so much as a missionary, but it's fun. I was able to do another baptismal interview. It was for Ankeny 2nd ward. They had a mother and daughter baptized on Saturday. There names were A and L, from Liberia. These last two interviews I have been able to perform have been amazing. To see the testimonies that these new members bring with them into the church and have the spirit testify of that has been humbling. Within each interview conducted, I felt the spirit absolutely confirm to me that these people were ready. It's amazing to see how the Lord works. So I will be staying here for some time. When we got transfer calls, President Jergensen told me that I would be staying a couple more transfers here in Ankeny. I'm glad, I don't like to move very much. I'm a little nervous about who my next companion will be. It could be Elder Eldredge, he's still a zone leader!! But who knows, it will be fun regardless. 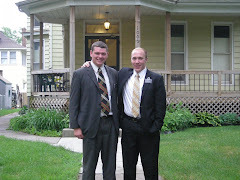 I really thought that Elder Curtis and I would stay another transfer. I don't think that I told you, but he is the son of the mayor of Provo. He's way cool and a great teacher. This last week was great. We held a zone p-day last Monday in Ames and had all sorts of fun. We played dodge ball and had a zone conference tournament. Marshall town won, so for the prize we brought free pizza coupons. I also did the baptismal interview that same day. I think you may have been confused. Dad you mentioned something about us having a baptism, but it was the Ames 1st elders. All I did was interview, still exciting though. It went great. His name is L and he has been so prepared for this. His whole family is Catholic and has been giving him all sorts of anti, but he has stayed the course and has gained a testimony of opposition. He is planning on going on a mission in a year, what a stud. I threw in a picture of zone p-day. 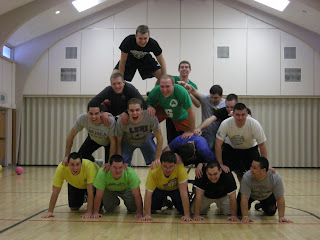 L played with us, he's the one on the very top. The next picture is last week's district meeting. 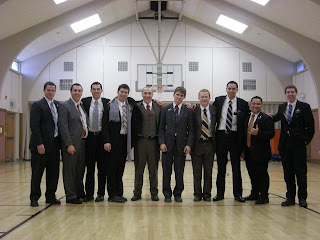 Elder Wayland gave me a sweet brown 3-piece suit so I wore it to District meeting. Our teaching pool has dwindled off. Every one we find and teach keeps getting antied. Its tough to see people who have committed to baptism and the next week call or hand the Book of Mormon back to you and tell you that you worship a "different Jesus". We have a couple of positive potentials lined up for this next week, but there is going to be a lot of finding this week. We'll see what happens, the Lord clearly wants us to teach someone else, or to find that one person who want to know the truth but knows not where to find it. You asked me this week if my stuff was holding up, my suit, socks, backpack, white shirts. Right now everything is holding up great. So far I have only worn one suit my whole mission, the black one. The pin stripes are starting to disappear but not a big deal. My backpack is falling apart. Melanie you were asking if you could do anything for me. Well I have a special assignment for you. I need you to find, with your flavorful eye of style and creativeness, and buy me a new backpack. Now not just any backpack, enclosed in this e-mail is a picture of a backpack that would work great for me. It needs to be darkish in color. I think the one in the picture is more if a skater backpack that's kind of what I'm going for. So if you could locate and acquire one that would be great. PS Could you also send me the famous "blue card chocolate chip cookie recipe" so I can make some for the members and investigators around here? Love you Family -Hale over and out. I received your letters this week. The pictures that you sent were funny. Unfortunately it wasn't accurate. While the blizzard blew through we were told to go inside. So we didn't have the snow and icicles plastered to our faces, but we did have some cold, cold weeks. There was a morning we went to work out and it was -27 and the high for the day was 2 degrees. That was brisk. I can relate to the man that said, "I can, like, feel my boogers freezing." That does happen. Thanks for the Valentine package. I'm not going to lie but I totally thought there was going to be some junk food in there that I would be able to munch on, good thing you didn't send any. This week has been great. The whole Ames district has set baptismal dates, that's 4 companionships. Some of which have not been to church yet so they are not yet reported, but every companionship has a date. This area has been dead for a couple of years, miracles are taking place. Today I get to do the baptismal interview for L, he is soon to be baptized on the 19th. He is part of the Ames 1st Ward. This will be my first one so I'm excited. Here in the Ankeny area, things have been slowing down. We had to drop one of our investigators because he will not progress. We were bummed about it this week until we received a super referral from a member at a dinner appointment, it was their neighbor. We contacted the referral and it was a lady who has been searching for "more" She is Catholic and says that she just doesn't fit in. She sees her neighbors and just wonders why they are so happy, why they are so friendly. She was so happy that we came by to talk to her. She wanted to hear it first hand from her neighbor (the member) about why and how she was so happy. This Wednesday we have this really cool missionary opportunity. There will be 100 Lutherans touring our church as part of their Communion. I may have already told you but I'm so excited about it. The youth will be hosting the tour and they will be watching The Restoration and a few of the youth will be bearing their testimony. They will get to walk around the building and are going to stop at the baptismal font. Hopefully there will be some questions that we can answer for them. I'm stoked. I thought there was a fraudulent charge on Brady's account (this is the 2nd time, the first time was real, this one was my error, oops) and I intervened with the bank. They closed down his debit card and then wouldn't let me order him a new one. Because he was out of our "region", they would require him to go into a bank with his ID. There are no bank branches in his town. What a mess. Ok, so when I went home last Monday after e-mailing you, the debit card was there. I just activated the new card over the phone this morning so I'll buy a little something with it today to make sure all is well. Next time I go on a mission I will remember to leave all bank accounts in your name, what a hassle. Thank you so much for watching out for me. I'm aloof to all that goes on around me besides missionary work. I'm not even sure how I would have solved this problem if it were in fact real. There is a vice president of the bank in our ward and I'm sure that he could lay down some smack talk to anyone that was giving you a hard time. So I'm curious what pictures Sister Anderson sent you. 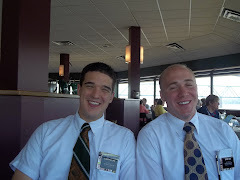 We had dinner with their family last Friday night, and she took a couple of pictures of Elder Curtis and I. 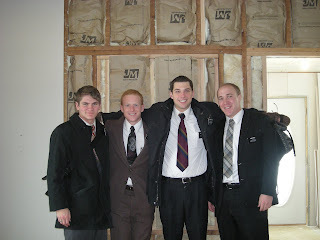 Here are a couple of the pictures - thank you Sister Anderson, it warms a mama's heart to know these missionaries are being taken care of . . . and what an awesome Christmas gift basket! I'm putting together a package for the family. You know that means that it will be sent next week or the following week but I thought I would build up the suspense. I'm going to print out a bunch of pictures today so they will all be labeled for you when they come. So I had some awesome letters come this week from the family. So the house is paid off!!! That is so cool. It sounds like dad took a big step of faith by paying the house off, but that was the council given from a prophet of God, and when we are obedient the blessings follow. I have a testimony of that. I think that you are already seeing the blessings flow with dad being so busy and all. Besides, I don't think that there is a better time to take a step of faith than when your son is on a mission. This week has been a crazy one. A big storm hit Tuesday night. It wasn't that bad in my opinion, but President told all missionaries to go inside for the night. We also had to stay in until 12:00 on Wednesday morning. 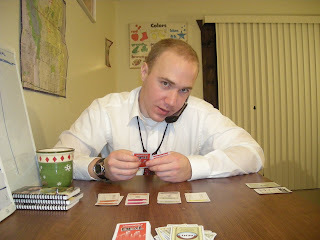 So in the meantime, Elder Curtis and I had a Monopoly championship. It was fun. We did get to do a lot of tracting this week though. As you know, our teaching pool shrunk when J's family moved, but we did find two more investigators. Their names are D and W. They are both young guys (19-20) and very interested in the gospel. W came to church yesterday and brought his sister. It was a powerful testimony meeting, and I think he liked it. Last night we went to his home and went over the restoration and watched the DVD with him. He's a little quiet so its hard to really know what he's thinking, But D, on the other hand is awesome. We just tracted into him, and he let us right in. We just started to get to know him and see where he was at in his life. He then just started asking us question after question. We answered them through the Book of Mormon. It was amazing. By the end of the visit we asked him if he would pray about the Book of Mormon to find out if it was true from God, then he just blurted out that it was true and he did not need to pray, because he already knew. We are going back tonight with a recent convert to go over the plan of salvation and set a specific date for baptism.